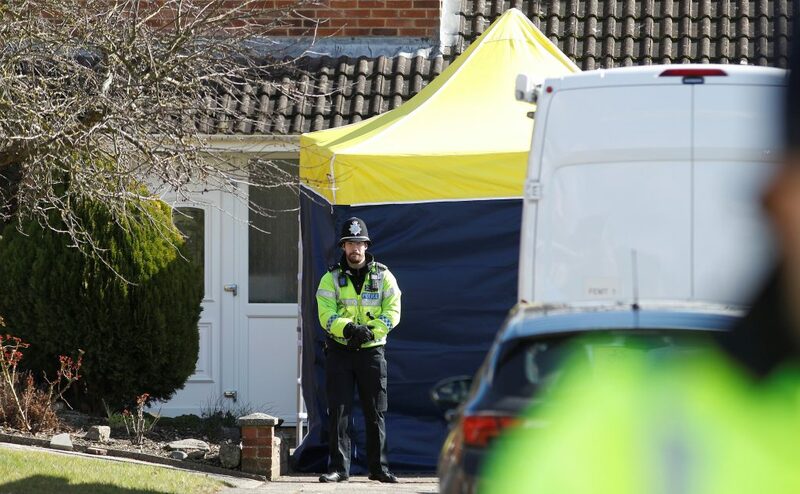 Russian former double agent Sergei Skripal and his daughter were poisoned with a nerve toxin that had been left on the front door of their home in England, British counter-terrorism police said. Skripal and his 33-year-old daughter, Yulia, have been in a critical condition since being found unconscious on a public bench in the English city of Salisbury on March 4. A British judge has said they may have suffered permanent brain damage. The attempted murder of Skripal, a 66-year-old former colonel in Russian military intelligence who betrayed dozens of Russian agents to Britain’s MI6 spy service, has plunged Moscow’s relations with the West to a new post-Cold War low. British Foreign Secretary Boris Johnson said the Kremlin had underestimated the Western response to the attack, which also injured a British policeman. Johnson told an audience of ambassadors in London that 27 countries had now moved to expel Russian diplomats over Moscow’s suspected involvement, which it denies. “These expulsions represent a moment when a feeling has suddenly crystallised, when years of vexation and provocation have worn the collective patience to breaking point, and when across the world – across three continents – there are countries who are willing to say enough is enough,” Johnson said. Russia’s Foreign Ministry said on Wednesday the circumstances of the Salisbury attack led Russia to suspect possible involvement of the British intelligence services. “If convincing evidence to the contrary is not presented to the Russian side we will consider that we are dealing with an attempt on the lives of our citizens as a result of a massive political provocation,” it said in a statement. Kremlin spokesman Dmitry Peskov said on Thursday Russia was also watching closely a media report that Britain might limit London’s role in marketing Russian debt to investors. An unidentified doctor who is treating the Skripals said they were both heavily sedated and unable to communicate, and that it was not possible to assess when or to what extent either may regain mental capacity, according to court papers. Since emerging from the world of high espionage and betrayal, Skripal lived modestly in the cathedral city of Salisbury and kept out of the spotlight until he was found unconscious on March 4. The attack on Skripal has been likened in Britain to the killing of ex-KGB agent Alexander Litvinenko, a critic of Putin, who died in London in 2006 after drinking green tea laced with radioactive polonium 210. An inquiry led by senior British judge Robert Owen found that former KGB bodyguard Andrei Lugovoy and another Russian, Dmitry Kovtun, carried out the killing as part of an operation probably directed by Russia’s Federal Security Service.